Part of selecting a good quality arrester is understanding the published data. A good quality supplier will fully disclose the relevant data in a format that is comprehensible and user-friendly. This article is a guide to understanding the arrester datasheet and what is behind it. 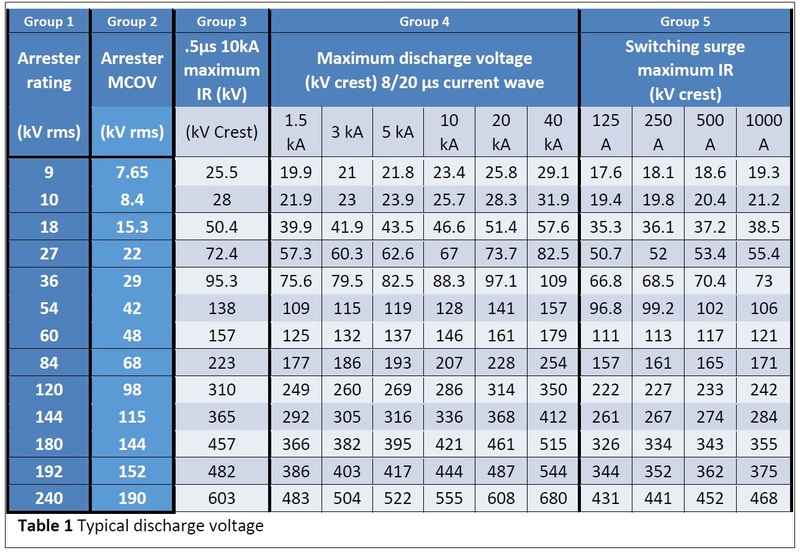 In every arrester datasheet, you will find a most important table about the discharge voltage of the arrester in question. 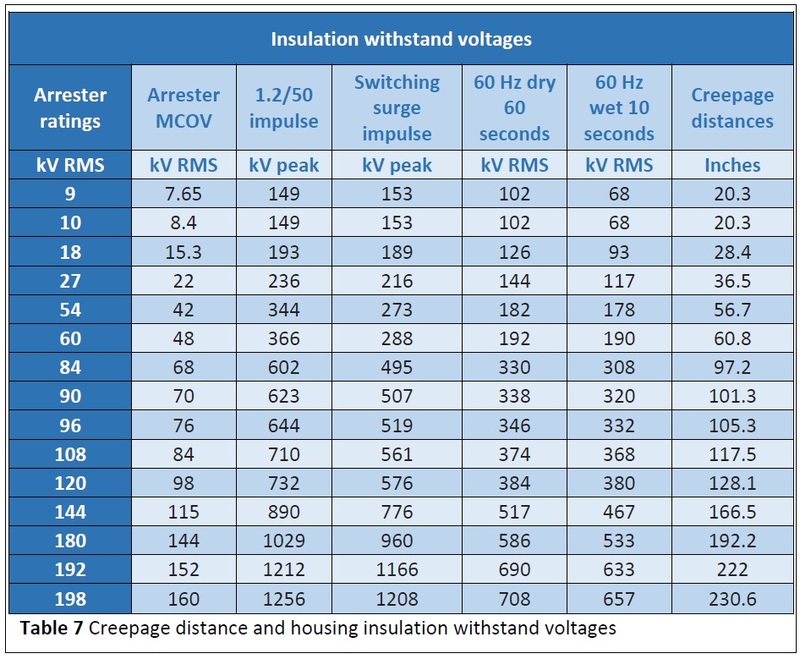 This table documents how well the arrester clamps lightning and switching surges, which is the fundamental purpose of arresters. This example is for a station class arrester but can be used to understand all discharge voltage tables of all arresters. Metal-oxide varistor (MOV) type arresters have two voltage ratings: maximum continuous operating voltage (MCOV) and rated voltage. The arrester MCOV is shown in group 2 of table 1 and given in kV (1 kV=1000 volts). This voltage is determined during the course of testing the arrester to IEEE standard C62.11 and is the most important voltage rating of the arrester. It is an AC rating and should in all circumstances be higher than the maximum line-to-ground voltage of the system to which it will be applied. 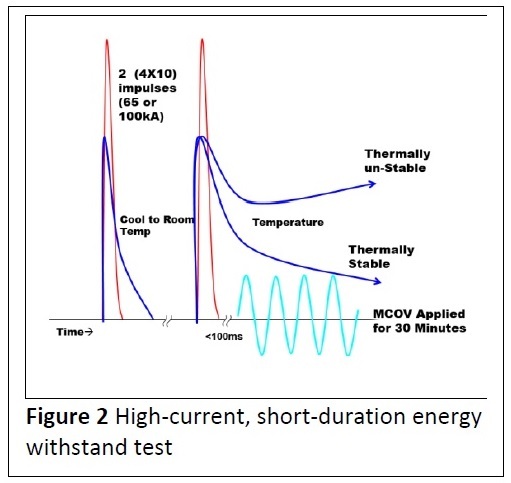 In some circumstances, due to higher temporary overvoltage (TOV) conditions, the MCOV may need to be increased on the arrester, but it should never be decreased below the steady-state line-to-ground voltage of the system. The rated voltage (group 1) is a rating from the days of the gapped silicon-carbide arrester and has become a number we are familiar with. For that reason, it carried over to the MOV arrester at its initial introduction to the market. Although the rated voltage of the arrester is not relevant to the actual operating voltage of the modern day MOV arrester, it continues to be a common designation used to specify an arrester. Group 4 data in table 1 shows the discharge voltage across an arrester. This data shows the discharge voltages for seven different impulse currents amplitudes all of the same 8/20μs wave shape. The wave shapes are shown in figure 1. Since lightning comes in various amplitudes, from a few kA (1 kA=1000 amps) to occasionally >100kA, this table shows what the clamping voltage would be for 95% of the impulse current levels that occur in nature. The data found in the 10kA column is most often used to compare one arrester to another. It is often referred to as the “lightning protective level” (it is also referred to as the voltage at the arrester classifying current). If two arresters are being compared, the 10kA, 8/20 discharge voltage in this column can be used to compare similar ratings, and the lower level is considered better protection. The data found in group 3 is another form of discharge voltage, also known as the front-of-wave (FOW) protective level. 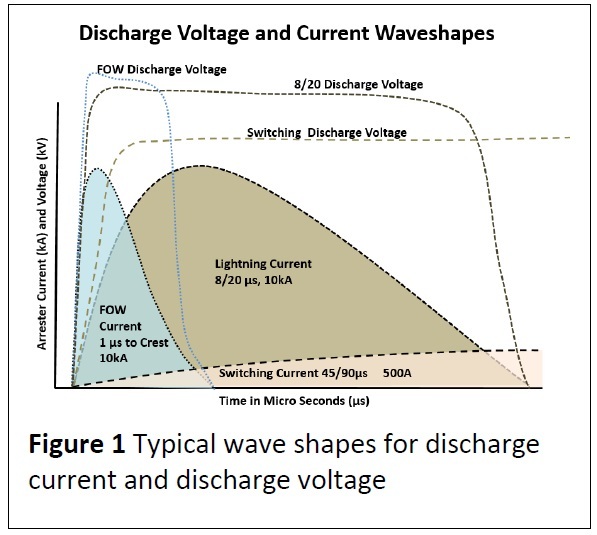 In this case, the wave shape has a faster rise time than the 8/20μs used for maximum discharge voltage and represents the second subsequent surges in a multi-stroke lightning flash. Per IEEE C62.11-2012, the current wave shape for this protective level is 1 μs to crest, with no specification on the tail. Note that, in table 1, the term IR is used twice: this is a term that means voltage, as in E = I x R, where E stands for voltage, I for amps, and R for ohms. This term is used by some suppliers but not all. The data found in group 5 of table 1 (switching surge protective level, 45/90μs discharge voltage) is the third type of discharge voltage that is measured and published for arresters. The peak current levels can vary from 125 amps to 2000 amps, depending on the class of the arrester. This discharge voltage represents the response of an arrester to a slow-rising surge generated within the power systems during breaker or switch operations. 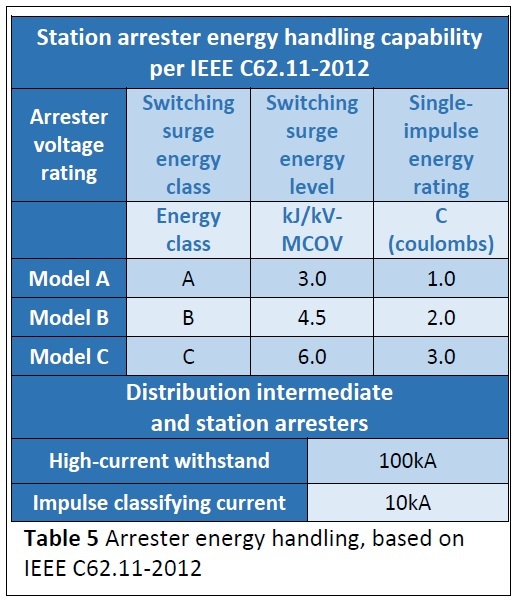 Probably the most widely used table in arrester datasheets is the arrester rating selection table. The example in table 2 is for both distribution and transmission systems. 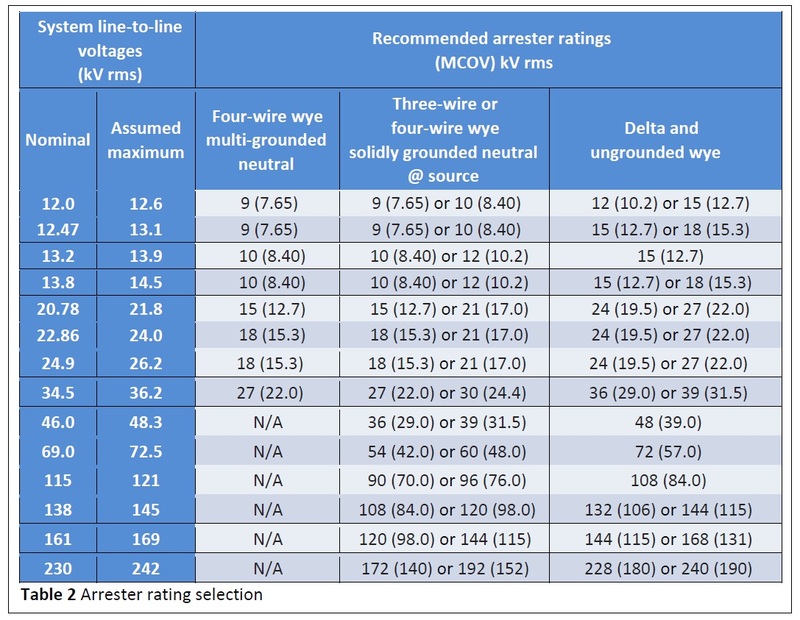 The two most important factors used to select an arrester rating are the system voltage and the neutral grounding configuration of the source transformer. These tables assume that the maximum duration and amplitude of the worst-case overvoltage during a line-to-ground fault are unknown. When two ratings are offered, the lower rating would be the minimum possible, and the higher rating is for the worst-case scenario when nothing is known about potential overvoltage events. Since most three-phase systems are referred to by the phase-to-phase voltage, that is how the table is set up. In many cases, the arrester rating is less than the line-to-line voltage because arresters are applied line to ground. The line-to-ground voltage is line-line voltage divided by 1.73, for those wishing to calculate it. 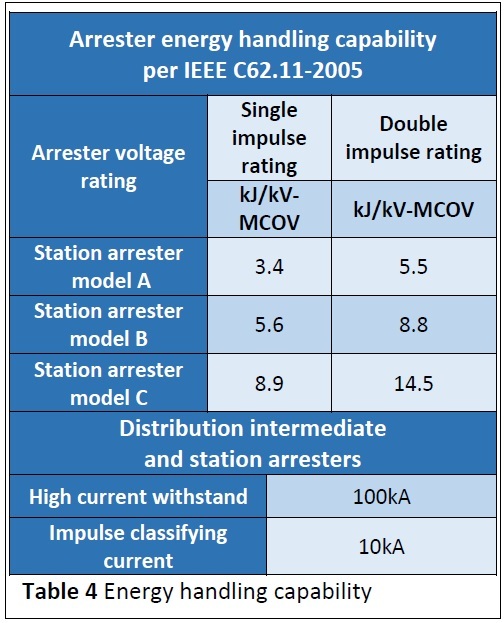 The nominal and maximum system voltages are both shown in the table; the arrester rating is calculated based on the maximum expected system voltage. This rating is divided into several columns to cover the various system configurations. The neutral configuration of the transformer providing the power to the circuit is the only neutral configuration that needs to be considered. Downstream transformers do not affect the potential overvoltages unless it is part of the fault source. This column is primarily a distribution-type circuit where the neutral conductor is grounded in many places along the circuit as well as at the feed transformer. In this case, the maximum overvoltage on this type of system is 1.25 per unit of line-ground voltage (pu) and the duration of an overvoltage is be very short (a few cycles). case, the maximum overvoltage magnitude is about 1.4pu and could last for a very long duration. This can be either a distribution or transmission circuit. In this case, the worst-case overvoltage from a faulted circuit is 1.73pu line-to-ground voltage. This means the line-to-ground voltage can increase to equal the line-to-line voltage in some instances. Per IEEE C62.11, all arresters shall have a fault current rating. This rating indicates how much 60Hz short-circuit current from the power system can flow through the arrester without violent rupture and large fragment expulsion. Note that this is not a lightning or switching current but instead a power frequency, system-sourced current. 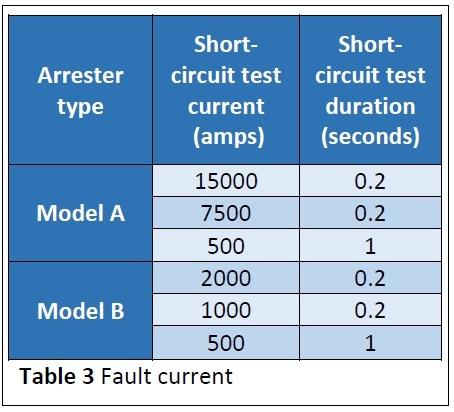 The short-circuit test is conducted by putting a failed arrester in series with a fault current source for the given duration in seconds, or cycles, as shown in column three of table 3. The listed current level must flow through or around the arrester for the given duration without expulsion of internal parts in order to pass the tests. Distribution arresters are tested at current levels up to 20,000 amps for 12 cycles, and station class arresters are tested as high as 63,000 amps and up. A lower current of 500 amps is also tested and is shown in table 3. To ensure minimum collateral damage to other equipment in the event that an arrester is overloaded, the available system short-circuit current should not exceed the level as shown in column two of table 3. Every good arrester datasheet will tabulate the energy handling capability of an arrester. The information in table 4 is according to IEEE C62.11-2005. In the 2012 edition, different tests are mandated and the values are different. Until 2012, this rating was not standardized, and manufacturers published slightly different levels. See table 5 for more information on how to use the new data. The impulse classification current, shown in table 3, is a value that some manufacturers choose to add to their datasheets to provide extra information. This is the impulse current level used during the IEEE duty cycle tests in IEEE C62.11. For distribution arresters, it can be 5 or 10kA, and for station arresters it can be 5, 10, 15, or 20kA. Generally, the higher the current, the higher the arrester durability. 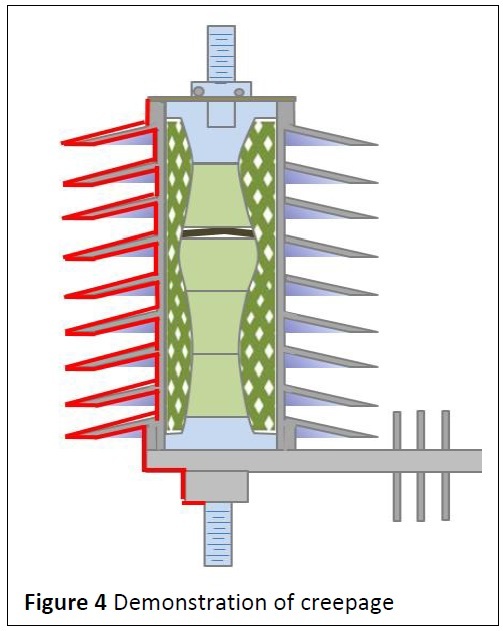 The high-current withstand capability is almost always found in an arrester datasheet, as shown in figure 2. This current refers to the impulse current level used during the IEEE high current short duration test. For normal duty arresters it is 65kA, for heavy duty and riser pole arresters it is 100kA, and for station class arresters the minimum level is 65kA. It may seem odd that a station class arrester can be certified lower than a distribution arrester, but this is because station arresters are designed for use in substations that are almost always shielded by overhead wires and direct strokes do not reach the station class arresters. This rating is actually the only means of evaluating the energy handling capability of a distribution arrester since they are not tested using other energy rating tests. This rating comes from IEEE C62.11-2005 and has been superseded by the switching surge tests in the 2012 edition. 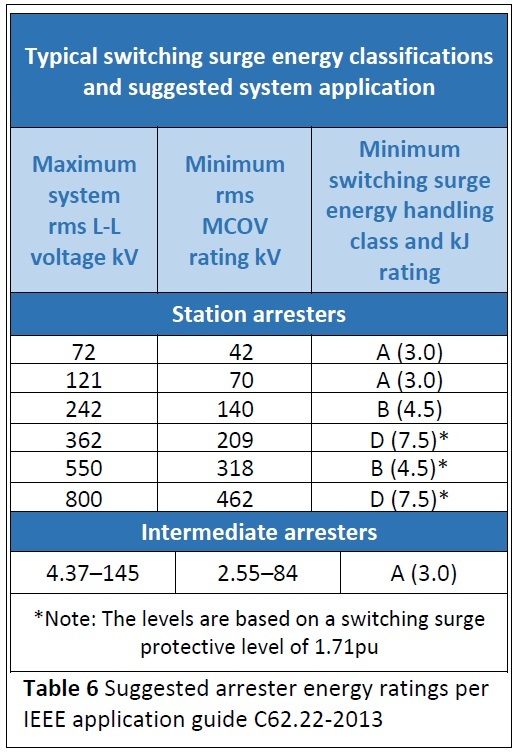 This rating, as shown in table 4, indicates the maximum-level switching surge this arrester can handle without out failing. Historically, this test was a one- or two-impulse test, depending on the supplier. The 2012 standard rectified this discrepancy. This rating applies only to station class arresters and not distribution arresters. The values are derived from running the transmission-line discharge tests. IEEE C62.11-2012 introduced two new energy rating tests for arresters. The switching surge energy rating is similar to the previous rated discharge energy. The benefit of this change for arrester users is that the standard now specifies how to calculate the actual rating, making this value consistent from one manufacturer to the next. Table 5 provides an example of how future ratings will be displayed in the datasheets. system voltages. This table is summarized in table 6 of this document. All good arrester datasheets will have a TOV curve similar to the one shown in figure 3. This curve is used to determine the minimum MCOV rating that can be used for systems that can experience a TOV. Note that arresters are designed to withstand AC overvoltages, not mitigate them. TOVs can be caused by single line-to-ground faults, loss of neutral, or other system phenomena. 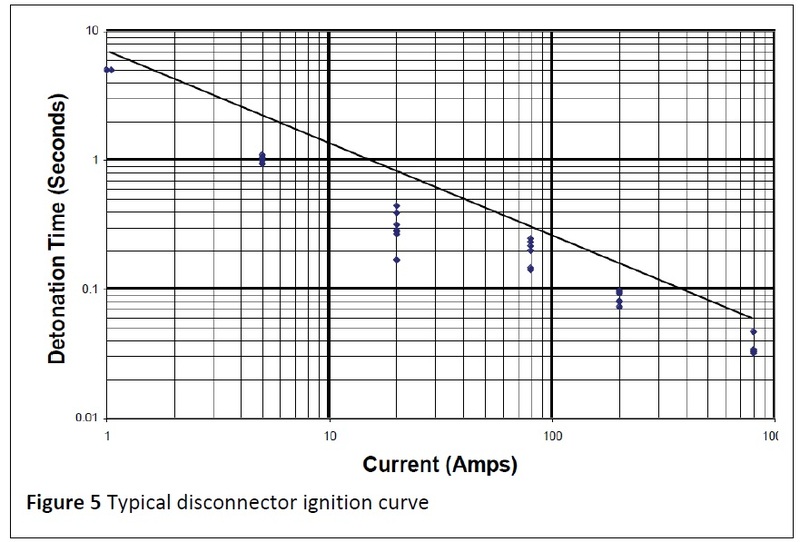 See IEEE C62.22 for more details on how to use this curve. In simplest terms, if a line representing the amplitude and duration of a TOV, as shown in table 6, crosses the arrester TOV curve, then a higher rated arrester should be used. For example, a TOV of 1.4 times MCOV for a duration of 100 seconds would exceed the capability of this arrester, and a higher MCOV would need to be selected. 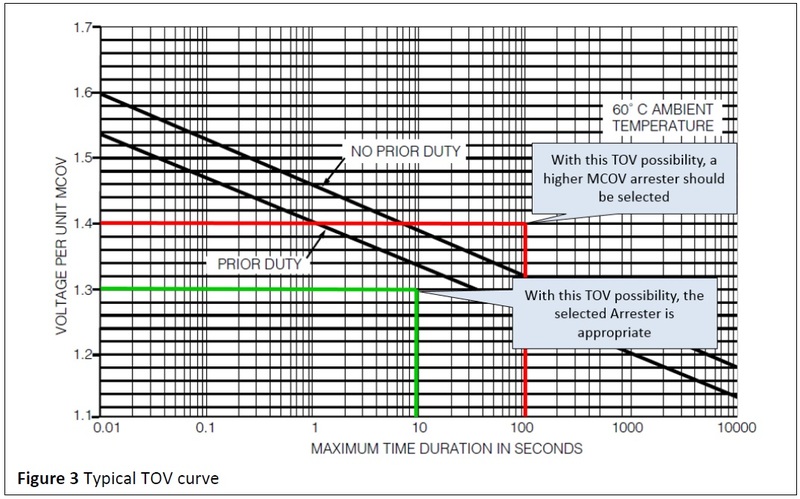 If a TOV of 1.3 times MCOV for a duration of 10 seconds (green line in figure 3) would not exceed the arrester capability, and the MCOV selected can be used. the case for single line-to-ground faults. If it is uncertain whether the arrester in question could absorb energy prior to the TOV, then the prior duty curve must be used, which is the more conservative method. Per-unit MCOV on the vertical axis is a convenient way to show the TOV for all arrester ratings. To get the actual overvoltage level that can be withstood by the model you have selected, multiply the PU level on the curve for the given duration by the MCOV of the selected arrester. As shown in figure 3, if the MCOV of your selected arrester is 98kV, then the TOV withstand capability for 10 seconds of the arrester 98kV arrester is 98 x 1.4 = 137kV.TOV is sometimes specified in a table with specific voltages that can be withstood for 1 or 10 seconds. This is the same data that is supplied with the TOV curve, but instead of being per unit MCOV, the TOV withstand voltage is in actual kV rms. The insulation withstand table presented in arrester datasheets, as shown in table 7, is easily misunderstood. The misunderstanding occurs when these values are compared to system basic impulse insulation levels (BIL). Arrester housing withstand values are not BIL; they are voltage withstand of the housing when the internal components of the arrester are removed (more below). The creepage distance is often but not always reported in the same table. The creepage distance for arresters, shown in table 7, should be similar to that of all insulators on the system to which it will be applied. Often for coastal or high-pollution areas, extra creep units are used. The definition of creepage distance is shown in figure 4. This is the lightning impulse withstand voltage of the arrester housing if the internal varistors are removed from the arrester, as shown in column three of table 7. Since the arrester will always be self-protected with the internal components, this characteristic is essentially irrelevant. This 1.2/50μs level does not and should not match the BIL of the insulators on the system. The level on the arrester datasheet will always be lower than the BIL of the system. The minimum value is mandated in IEEE C62.11-2012. This characteristic of the arrester housing is also measured without the internal components of the arrester installed, shown in column four of table 7. With the internal components of the arrester installed, this level will never be reached because of the self-protecting nature of an arrester. This level will very likely not be as high as the switching impulse withstand characteristics of the system. The minimum value is mandated in IEEE C62.11-2012. These two withstand characteristics have mandated minimum values per IEEE C62.11, as shown in columns four and five of table 7. The minimum value is based on the system voltage, maximum application altitude, and maximum TOV of the arrester. These values do not need to be the same as the insulators on the system. 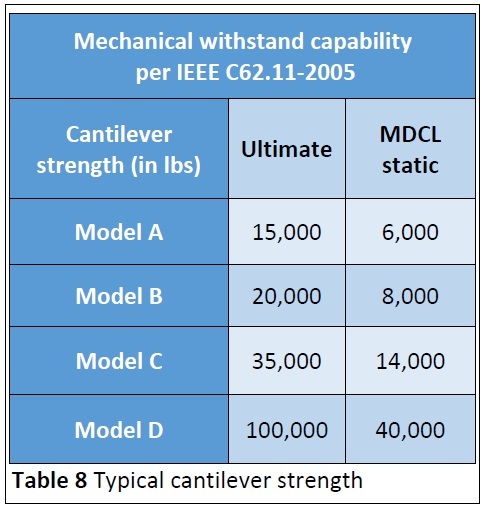 The maximum design cantilever strength (MDCL static), as tabulated in table 8, is tested and verified during the IEEE certification test process. This is the steady-state working strength of an arrester should it be used to support bus or cable. It is generally understood that for mechanical systems, such as the polymer housed arrester, the working strength (MDLC Static) is 40% of the breaking force or ultimate strength. Figure 6 shows the basic setup of the test. 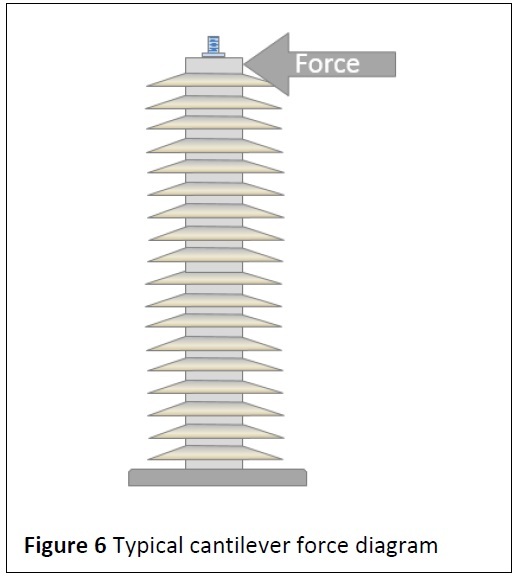 The cantilever strength is tested by applying a force until the unit breaks. This is the ultimate mechanical strength (UMS) of a porcelain housed arrester. It is accepted that the working strength is 40% of this level. Arrester datasheets will vary from manufacturer to manufacturer, but the basic data is all the same. The definitions above cover all complex characteristics found on these datasheets. If the datasheet does not cover all the topics discussed in this document, a quality supplier will be able to provide this information.